USA- A Real Patron of Cambodian Opposition! Phnom Penh (FN), Feb. 16 -It’s of utmost surprise that the U.S. Embassy in Phnom Penh, through its own social network, has released a message deemed to have violated a principle prescribed in the UN Charter - which stipulates that one state must not interfere in other internal affairs - and to have abused the diplomatic protocols. Following their claims to have had no responsibility on the possible criminal acts of +3 million tons bombardment on Cambodia and their denial to have backed Lon Nol and Serey Matak to overthrow Samdech Norodom Sihanouk, which led to the killing field between 1975-79, on 15 February 2019 the U.S. Embassy in Phnom Penh had issued another message, which deemed to incite and interfere into Cambodia’s affairs, as well as abuse the Cambodia’s judicial power. It shows clearly the abusing nature of the civilized state’s officials on UN laws and charter - a state claimed itself the master of human rights, democracy and rule of law. They were changing the mindset of a few Cambodian staff working in the embassy to forget Cambodia’s history, to look down on its own sovereignty in exchange for salary, and to forget the time when their grandparents and parents fled their boss’s bombardment. 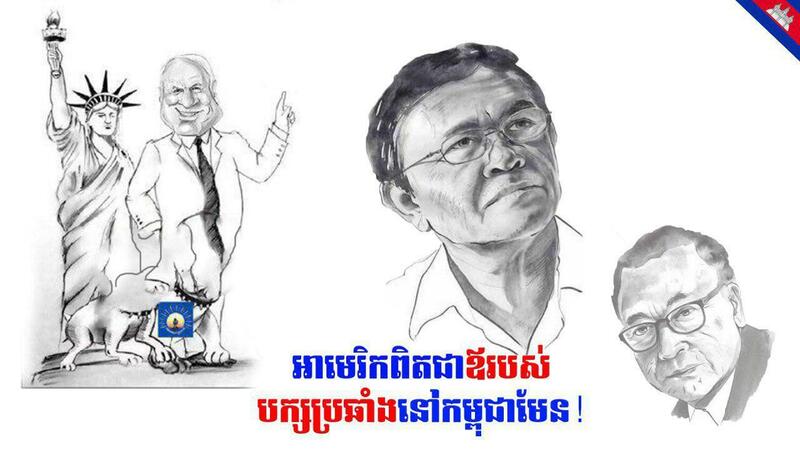 The message that was shamelessly posted by an embassy staff on his Facebook page, which deemed to interfere in Cambodia’s internal affairs and sovereignty, read “Did you know that Kem Sokha has been detained for almost 18 months? It’s been 530 days of imprisonment. He’s innocent and has been detained unfairly under false charge. There is no evidence against him...” . Why did the U.S. Embassy staff know Kem Sokha is innocent? If he thinks detainee Kem Sokha - who was charged under treason and conspiracy charges - is innocent, he should give testimonials in the court as witness in the case. Dare the U.S. embassy staff confirm what Kem Sokha said about the U.S. back him and Sam Rainsy in their Arab Spring revolution attempt? In Australia in 2013, Kem Sokha said “Since 1993 when I was first elected as a lawmaker, the U.S. government invited me - the first of all National Assembly members - to visit their country to study how democracy works. They invited me once a year since 1993, and until recently, they believed that it’s time for a change in Cambodia. They asked me to temporarily phase out from politics; so I decided to resign from politics and from the political party’s membership, where I was since 2002, to establish an organization call ‘Cambodia’s Human Right Center’. What’s their (USA) purpose? They said if you want to change the top leaders, you cannot confront them. Before you can change them, you must overhaul the grassroots first. This is the strategy used in democracy. These activities were later confirmed by convicted Sam Rainsy, confessing that he was one of the mastermind of the color revolution. Moreover, the testimonial Kong Koam gave to the court in Kem Sokha’s treason case also verified that the former CNRP used color revolution to seize power undemocratically. However, the color revolution plan failed and the mastermind was handcuffed and detained. The U.S. embassy staff should not try to fabricate the evidence which is enough to arrest traitor Kem Sokha - in the middle of the night - and if such culprit has freedom, he will surely execute his boss’s plan. Did the U.S. embassy staff hurt when he saw his pawn was arrested and detained on conspiracy charge? It’s true that the U.S., on behalf of the opposition‘s patron, especially Kem Sokha’s, would certainly not happy to see their pawn being detained. The Cambodian people know clearly that what the U.S. left in Cambodia were bombshells, which caused casualties among Cambodians everyday, as well as the ‘dirty’ debt which the U.S.-backed Khmer Republic used to purchase weapons to kill own Cambodian people. The present Cambodia is different from Cambodia in the past 40 years, and the present Cambodia is fully independent and sovereign, and has the rights to manage its own destiny and would not serve any nation’s geo-politics. On behalf of a country that claims itself the Father of Democracy and Human Rights, the U.S. embassy staff in Phnom Penh should observe diplomatic protocols and UN Charter, and should avoid proclaiming itself as Cambodia‘s patron - an independent state - and should not interfere in Cambodia’s internal affairs and judicial power. U.S. is not Cambodia’s patron! It’s actually the real patron of the Cambodia’s opposition only.